Under Paul Muad'dib's rule as Emperor, the planet Arrakis has enjoyed a renaissance. However, the revolution Muad'dib has inspired has transformed into a brutal jihad and a conspiracy threatens to rob Muad'dib of his throne and his life. 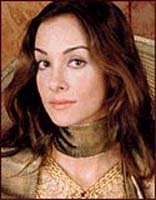 The future of all of humanity rests in the hands of Muad'dib's heirs - specifically his son, Leto II, who is destined to become a force for sweeping changes, both on Arrakis and in the universe at large. TV is getting real good these days, and while this second mini-series from Frank Herbert's epic saga might not be The Sopranos or Six Feet Under, it is riveting stuff. A direct follow on from 2000's Dune, and featuring much of the same cast and production crew, it is also a step forward scripting, acting, directing and, most immediately apparent, production values. Strange thing about TV, that. Unlike film, it often is better the second or third time around. The ratings success of the first series has allowed the producers to throw a lot more money at the screen. Where the first series was criticised for mixing some good CGI with obviously painted backdrops, Children of Dune is state-of-the-art. This time around, only the ad breaks serve to remind that you are not watching the DVD from a big budget Hollywood production. The CGI delivers some amazing cityscapes, angry looking worms and stunning action set-pieces. The 'real' sets are equally good, richly detailed and wholly appropriate to the tale's operatic tone. All this eye candy would count for nought, however, if script, direction and acting were not up to scratch. Herbert's work is a right old jumble of intergalactic soap opera, reflections on religion and commentary on the use of power, to pick out just three strands. Translating that from the page to the screen - not to mention dealing with some of worst names in sci-fi history and the author's fetish for aphorisms - is a huge task where everything has to be in place. John Harrison, the man behind the original series as writer and director, returns but this time handling only the script. He has the form, and most of the time skilfully blends the saga's second and third titles - Dune Messiah and Children. It's also worth saying that what he has to work with is more dramatically interesting than the essentially traditional antagonists in the first novel. Muad'dib's realisation that he is trapped by his own ability to see the future, not to mention the way salvation paves the way to a bloodbath, makes part one a gripping opener. As the focus shifts in parts two and three to Paul's children and the way House Atreides starts to eat itself away from within, Harrison keeps the potentially confusing plot clear and engaging. Yes, there are a few wince-worthy lines, but almost all come from the original. Stepping in as director, Greg Yaitanes [pictured left] - a veteran of the most recent take on The Invisible Man and cult series Cleopatra 2525 - is much more ambitious with his camera than Harrison and keeps the pace snappy. He gets great help from cinematographer Arthur Reinhart and editor Harry B Miller III. Mini-series often seem leisurely affairs, but this makes its points, maintains the tension and moves along at a real clip. Yaitanes' other big plus comes on the acting front. 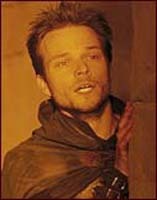 Alec Newman returns as Muad'dib and while he was good in the original, this time he really gets to show off his range. 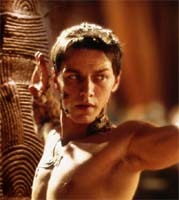 His career perhaps did not take off after the first Dune, but this time around the Glasgow-born actor should get ready for something big. Any kind of messiah is a thankless role but he lends his performance depth, humanity and intelligence. A second starmaking turn comes from James McAvoy, another Glaswegian, as Leto II. There is a similar depth and also a brightness to his performance that make his ultimate sacrifice all the more affecting. Completing a trio of outstanding newcomer performances is Daniela Amavia [pictured right] as the tragic Alia. When she's bad, she's scary, but she never goes too far - and again keeps the human element clear and upfront. These three also succeed in standing out amid good company. 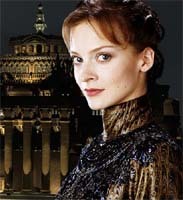 Susan Sarandon brings a touch of Hollywood as the villainous Wensicia - although the role is often underwritten as a piece of Bond villainy - as does Borg Queen Alice Krige, who takes over from Saskia Reeves as Jessica. Ian McNeice contributes an effective cameo as a returning Baron Harkonnen (if you don't know why and how, we won't spoil it for you) and Steven Berkoff gets to play the good guy for a change as Stilgar. What's good about all these performances - indeed, this praise goes right across the cast - is that they play it straight. Even Berkoff, renowned for his 'theatricality', manages to be physical and imposing without succumbing to temptation. Hamminess and Herbert do not mix - just ask David Lynch. The biggest challenge with this project was probably satisfying the saga's fans and producing something that the unitiated could follow, even if many nuances and ironies would be lost. Watching this mini-series with a complete Dune virgin and someone who usually hates sci-fi, my conclusion is that they have pulled it off - in spades. 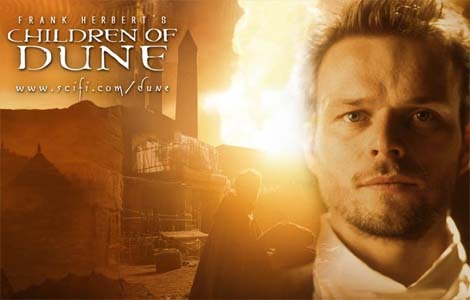 Children of Dune was co-produced and shown by The Sci-fi Channel in the US, but it is unclear at this time whether the company's European subsidiary holds first run rights as well. Hallmark Entertainment, which also operates a Sky Digital channel, is another of the co-producers, and there are rumours that Sky One has picked up the series. 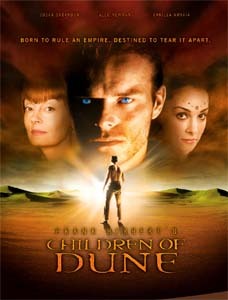 Children of Dune will be released on a Special Edition DVD in north America during May.